John Travolta arrives for his close-up camera-ready—a state of perfection he has attained without aid or interference from the squadron of makeup artists, fashion people, and on-set Ukrainian seamstress whose job today is to get John Travolta camera-ready for his close-up. He is ready even before anyone lays eyes on him—possibly before his private jet touches down on California concrete (piloted by himself), and certainly by the time he emerges from his luxury SUV (driven by someone else). He is wearing a suit from his own closet. 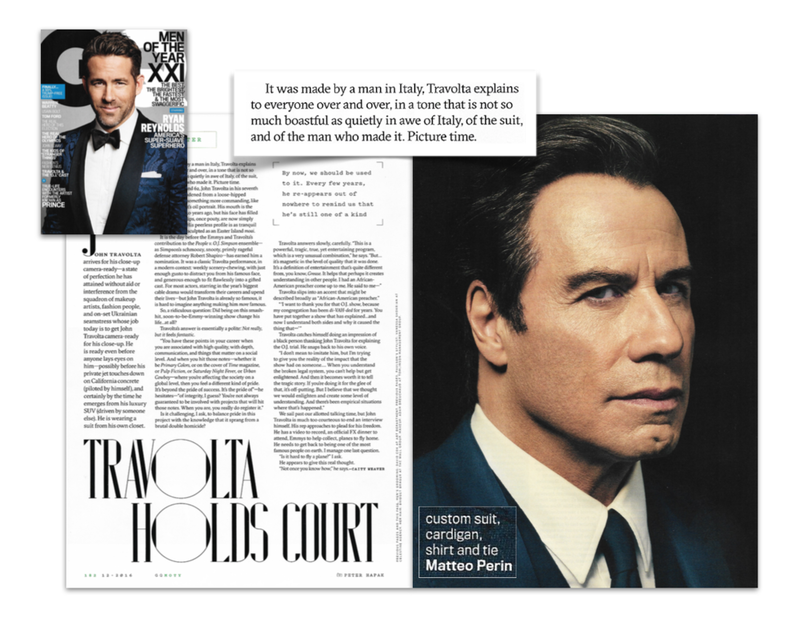 It was made by a man in Italy, Travolta explains to everyone over and over, in a tone that is not so much boastful as quietly in awe of Italy, of the suit, and of the man who made it. Picture time.